Wendy Bridgeforth – visual artist. She grew up on the East End of Bridgeport. She attended the Silvermine College of Art in 1970, and later studied graphic arts. Bridgeforth is an original instructor of the A.B.C.D. Cultural Arts Center (affectionately known as the Art Center), a vibrant cultural center active in Bridgeport during the 1970s and mid-1980s. She is an award recipient of the P.T. Barnum Festival juried art competition. 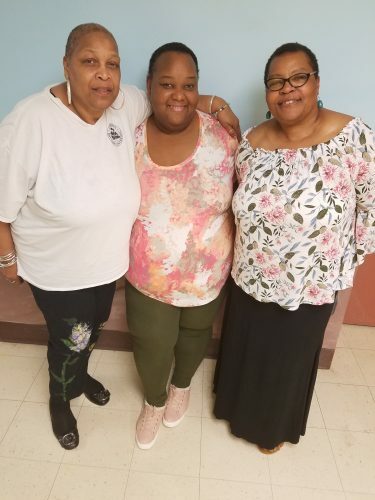 She took a nearly twenty-year hiatus from the profession of art to raise her relatives’ children, working at various jobs including custodian for the Bridgeport Board of Education. Bridgeforth is an early childhood art instructor at one of the longest running daycare centers in the city of Bridgeport, cementing her more than four- decade career of instructing various age groups with an emphasis on children’s art education. She enjoys painting by the water at Seaside Park. Ina Alisa Anderson – singer, writer, director, playwright. She was raised in Father Panik Village, and attended Waltersville, East Side Middle School and Harding High School. Anderson retired with the rank of Lieutenant from the Bridgeport Fire Department. She is a minister at Mount Aery Baptist Church. She has both performed and directed productions of the Maafa, commemorating the holocaust of the trans-Atlantic slave trade. She is the founder and CEO of Emerging Voices Production Company, specializing in the writing and production of community theater. Shanna Tanika Melton – poet, painter, art consultant, educator. She was born in Bridgeport, moved to California, and returned to the city, where she grew up on the North End. She attended Wilbur Cross and Central High School. Melton continued her education at Housatonic Community College, Southern Connecticut State College, and Northeastern University. She is the creator of The Writer’s Group, and is a frequent curator of events such as the Lyrical Voices Night of Poetry & Arts. Melton’s work has received city, state and national recognition. Her portrait of Kalief Browder was featured in both African Voices magazine, and in a documentary of the young man produced by Jay-Z. Melton is the Producer/Director of Maafa 2018. Her art work is currently on view in an exhibition documenting the Freeman Little Liberia Houses at Housatonic Community College. I never saw Bridgeport as being cultural or an arts scene. When I initially, you know, my little [inaudible], this was before all the government programs. ‘Cause the only thing that was here in the city of Bridgeport was Parks and Recreation. That’s when I started to explore creativity. Right here at Newfield Park, that’s when I started to explore creativity by arts and crafts. One of the park leaders saw that I was interested in art and, like I say, I was very naïve, and I was in a restricted household. I mean, my mother was like this – when she said whatever, we did. So, she never saw the worth in it. I pursued something that I just had the strong desire that I was going to get into. And later on I found out my favorite artists, but usually I had to sit in a room where I was the only Black person. Which was very hard to do, and be creative. Sometimes the teachers didn’t even know what to say to what style of work I was producing. So, later on when the programs came in, like A.B.C.D., when they put the Art Center, when they put that program together, and they had Out Bridge [sic, referencing Youth Bridge], the drama [referencing the Drama Club], that’s when it started for me. When the artists came through the Art Center. I always feel like I have the obligation to tell stories of people of color through my art because we don’t get that enough. So, there’s been this guilt about just wanting to paint a water scene. Right? [Laughs] Or even, maybe, a lack of interest or feeling that it’s archaic because it’s not enough. But it is enough. There’s this need for every day, mundane images of people of color that are not just revolution, maybe just chillin’, that is lacking. And, I don’t know if it’s necessarily lacking, but it’s not as visible as, like, a Black Panther. You know what I mean? But it’s necessary because we do just sit in circles, or we do just get up and look out the window. That doesn’t get captured. In the earlier years, my mother’s sisters and brothers were Philadelphianites. I spent a lot of time in Philly. I have a cousin who’s now deceased, Edward Chambers, “Spanky” he was called in the industry. Wonderful guitar player. He had the pleasure of playing all across the country, around the world, and in different genres, and we would get together, just cut up and experiment, and just do what it was that we did. The street that my aunt lived on, 28th Street, there were singers. Like the Three Degrees, you know, they would come to the house and we would go down to the basement and have jam sessions. We would end up going to Uptown Theater. Aunt Pearl would have everybody at her house after the shows were over. You get to just meet artists, and people. A lot of that stuff, I think, when I was young I just kinda took it for granted that this is what people do. Later on, I always found myself strange. We grew up in Father Panik, but inside our house was very Southern. The floors were always very shiny. My mother always kept the apartment very immaculate. We would do stuff like go out, get chickens, and pull the eggs [feathers?] from the chickens. Just crazy stuff! Inside the house! But from that, music, whether it was jazz and John Coltrane, and whether it was R&B, and when funk came out, and you know, the biggest challenge I had was how am I gonna say this word in the presence of my Mom and get away with it… Probably, when I was about 17, I started writing. We would enter into pageants and stuff, and speaking, doing spoken word was how I got to see all of the East Coast and Canada, and going out West. Just because of being a part of the movement. And that was always what I told, I told what I knew. Just a rebel at all times. As an artist, I have the opportunity to offer the alternate perspective, the alternate reality – my reality. And I’ve actually struggled a lot in the recent months with the conversation of “is advocacy as an artist sufficient or are you required on some level to be an activist at the same time?” Because there’s a lot of people I see who are fine with just the advocacy. But I’ve always known myself to be an activist through my art on some level. Especially as you get older you don’t have the energy for a lot of the stuff [Laughs] because the Chronic Black Fatigue can get real. You kinda play with the idea of “Is advocacy enough now?” Do I make room for other people, how I make room, and then you see some ignorance blow up and you’re like “Oh, God” here I have to go. And I know that’s how generations before me have felt. And so there is a point where you sort of have to let go, and let the world do what it’s going to do ‘cause it’s going to do it regardless. But I think it’s a blessing as a creative person to be able to add your voice and your perspective and what you know to the conversation. And when we’re not here anymore, they’re going to do what they want to do with it anyway, but at least you’ve said it. Note: Special thanks to Frankie White, Executive Director of the St. Mark’s Day Care Center for allowing us space within her facility to host the discussion. N.B: The circle affirmed unanimously that Wendy Bridgeforth’s lifetime membership as an artist is in good standing, no matter the hiatus.